The perfect wedding requires perfect planning. At Revere Travel, we believe your honeymoon requires the same attention to detail. Your honeymoon should be the most memorable, magical holiday you've ever taken. It’s the perfect excuse to do something really special for yourselves, whether that means 5-star luxury, relaxing on a tropical beach, just yards from your villa or an adventure through jungles and mountains. 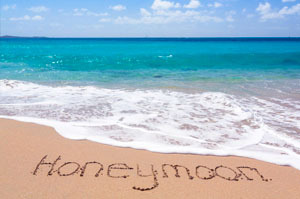 Whatever your definition of honeymoon is, at Revere Travel we can create something bespoke to fit. At Revere travel we pride ourselves in delivering a unique tailored-made honeymoon that perfectly suits your needs. Whether you have been planning your dream honeymoon for years or have no idea where you want to go, we will provide you with all the help you need to ensure that your individual requirements and expectations are not just met but exceeded. Our bespoke service means that your honeymoon is tailored to suit your budget, interests and individual dates. For many, a luxury honeymoon will be the most indulgent holiday of their lives, which is why at Revere Travel we apply all of our knowledge and expertise to make the most memorable experience possible. We aim to create a honeymoon to inspire and delight in equal measure. After the frenetic pace of the build up and the excitement of your wedding day, your honeymoon allows you to reminisce about your amazing day, and take some much-deserved relaxation. This is why a fabulously luxurious beach holiday can make the perfect honeymoon. It represents the ideal fantasy luxury escape. Never ending white sand beaches, swaying palm trees and wide open spaces are what dreams are made of. From a gorgeous boutique hotel on a Caribbean island, to an over-water villa in the Maldives or a secluded 'vale' in Fiji, Revere Travel can offer you a wide range of wonderfully romantic beach retreats to choose from. Perhaps allow us to create a tailor-made honeymoon for you that combines lazy days on the beach with a cultural or active experience – it's entirely up to you. Famed for its clear blue acquiescent waters and platinum white sand beaches The Caribbean has to be `the’ archetypal beach destination and ideal location for a luxury honeymoon. At Revere Travel we love the laid-back elegance of the Caribbean; it’s where everyone, including royalty and celebrities can come together to relax, unwind and enjoy the chilled out vibe that is omnipresent on every island you visit and as such provides the ideal location to relax after the excitement of your wedding. The months of December through to April are the driest periods in the Caribbean and so represent the best time to travel. However, Summer and Autumn are still good times to travel as the temperatures are only a few degrees warmer, though there is an increased likelihood of short showers. From the unmistakable shores of the Seychelles, with beach scenes unlike any other, to Mauritius, where you will experience an island paradise complete with pristine white sand beaches and lush interiors, to the unforgettable sights of the Maldives’ island atolls that teem with a kaleidoscope of marine life - the Indian Ocean is an unforgettable fairytale destination and an ideal place for a luxury honeymoon experience like no other. The peak season for Mauritius is from October to April though the temperatures are good throughout the year. During the summer season the north of the island is the best location because of the trade winds. The Seychelles is a year round destination for beach lovers as the climate is always warm, with temperatures that rarely drop below 24°C or rise beyond 32°C. The driest months in the Maldives are December through to April and so they are the best times to go, though the mild tropical temperatures make it a year round destination. Asia provides a wide range of locations ideal for a luxury honeymoon beach escape. The beaches of Malaysia are known for their idyllic quality and the culture and cuisine of the region make it a fascinating and intoxicating destination. Thailand’s beaches and coastline are also a popular beach destination as the famous Koh Samui is legendary for its platinum white sands that stretch for miles and miles. Boasting some of the world’s most romantic cities, stunning coasts and beautiful islands, Europe can provide the prefect destination for your luxury honeymoon. The potential for a magical escape here is huge. Your honeymoon could incorporate a few days strolling around the little streets and waterways of Venice followed by a stay on Croatia’s coastline of crystal-clear water and hidden beaches. Or perhaps you’d like to explore cultural Seville before heading to the tranquil Andalucian countryside. Europe can provide stunning locations, depth of culture and cuisine, all within a short travel time, so you can spend more time on your holiday and less time travelling. A firm favourite with Revere Travel, Dubai is probably the most popular destination in the United Arab Emirates (UAE). Recognized as the ‘Pearl of the Persian Gulf’ it offers visitors fantastic shopping and some of the region’s best beaches. However, many of its neighbours offer a wealth of experiences. Discover the timeless and exotic Oman, a largely undiscovered paradise, with its ancient archaeological sites, magical capital and stunning long golden shores, palms and groves of citrus trees set against dramatic mountainsides. At Revere Travel we believe that you should experience as much as you can on your honeymoon. One of the best ways of making the most of your holiday is to enjoy a twin centre break. We can recommend some destinations that complement each other perfectly. When you book with Revere travel we provide you a bespoke holiday that is designed to meet your specific needs, this means that the options are endless. Here are some suggestions to get your imagination going. From the hustle and bustle of Cape Town and the beauty of the Winelands, to the awe-inspiring experience of safari and the Big Five, South Africa offers an exciting and eclectic holiday experience. Twin this with the lush and magical island of Mauritius where a fairytale tropical beach awaits and a dream combination for a honeymoon is created. A firm favourite with Revere Travel, why not spend time relaxing on the idyllic island atoll collection that are the Maldives, where the hustle and bustle of modern life seems a distant memory. Combine with the lively cosmopolitan city of Dubai, were you can indulge in a shopping extravaganza. This amazing city provides something for everyone and is the ideal stop on either your outbound or inward journey. The Caribbean offers extraordinary island diversity, with island hopping made easy by regular scheduled flights and private charter flights so you can contrast the sophistication of Barbados with the seclusion of a smaller, less developed island. What better way to enjoy a luxury honeymoon than to take in the opulence of two of Greece’s most romantic islands; Mykonos and Santorini. These locations are now regular holiday destinations for the rich and famous and they make an ideal honeymoon setting.